The pressure switch is used to manually turn the compressor on/off and will also start the compressor when the pressure drops and stops the compressor when the pressure reaches the upper setpoint. 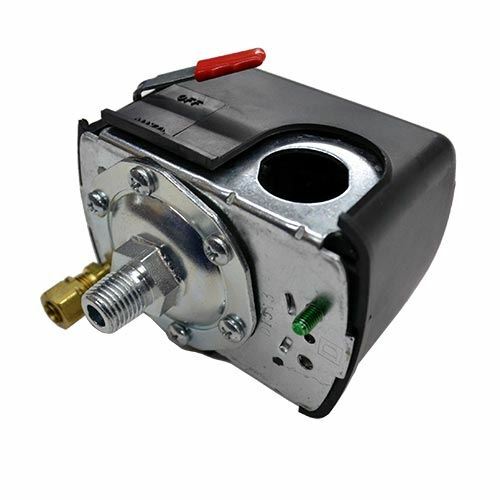 This switch was used on the majority of RolAir’s electric wheelbarrow compressor models. There is a single male threaded port on the bottom of the switch that would thread directly into the tank or into a tank manifold. There is also an unloader port which will connect the copper or plastic unloader line from the tank check valve to the switch. An on/off lever is also included with this pressure switch. This will turn the compressor on when the PSI gets below 105 and will turn the compressor off when it reaches the 135psi upper setpoint. This is an OEM switch that was manufactured by Square D.